- Legg gelatinen i bløt i kaldt vann i ca ti minutter. - Bland den oppløste gelatinen i saften og hell i serverings-/porsjonsskål. 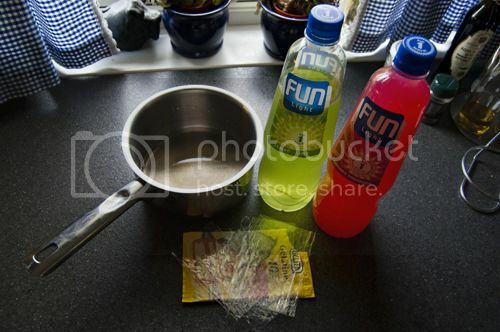 - Put the gelatin in cold water for about 10 minutes. 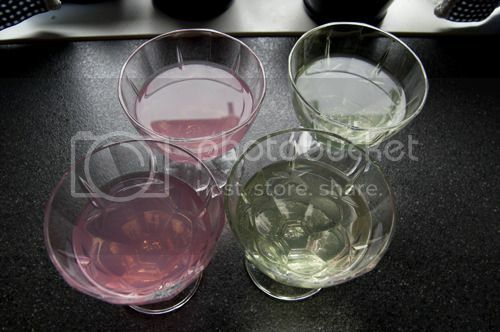 - Squeese carefully as much water as possible out of the gelatin and dissolve it in 0.5 dl warm/boiling water and stirr until it is all dissolved. - Mix this with the fun light and pour into serving/portion bowls.